What does our playlist say about us? It has been said that music sparks creativity in the human mind as we envision in our heads the story of the sounds we hear. But have you ever considered that your taste in music also tells a story about you? Studies have shown (not surprisingly) that your taste in music is a reflection of your personality, offering a glimpse into your tastes, values, aspirations and goals. And, as anyone who has been, or has had a teenager knows – it also can be a means of expression for things impossible to express. 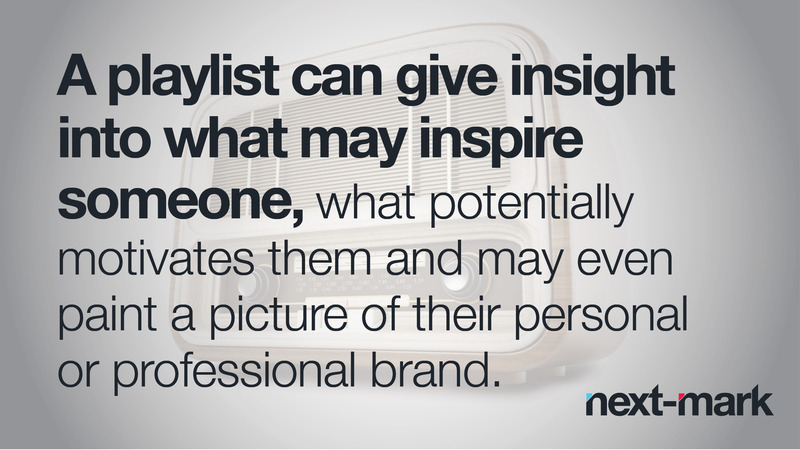 A music playlist can give insight into what may inspire someone, what potentially motivates them and may even paint a picture of their personal or professional brand. Here at Next-Mark, as audiophiles we place high value on the power and influence of music and its ability to tell our story. So this month, we thought it would be fun to create a playlist of songs that best sum up who we are as an agency and what we stand for. By the title of the song, you might be able to infer why it made our playlist. Things are continuously shifting, whether it’s changing consumer tastes, or the way they wish to be reached. Whatever the change may be, it’s quintessential that we help our clients to remain “Forever Young” in their content and marketing practices, to evolve and adapt in order to stay relevant. The fundamentals of marketing will always remain the same but with the marketplace changing at the speed of technology, here at Next-Mark we have no choice but to stay ahead of the trends and accurately anticipate the next big things, or else we risk becoming “old news” to our clients. “Stronger” explores themes of empowerment and recovery with the chorus inspired by a Friedrich Nietzsche quote: “That which does not kill us makes us stronger.” Resilience is something we practice everyday at Next-Mark. When things get tough or deadlines compressed, we just dig deeper because we know people are counting on us. And, by always doing our best, we can accept those occasional stumbles that happen to everyone, using them as lessons learned to become even stronger and even better prepared for the next challenge. It’s no secret that marketing has shifted exponentially in the last decade or so due to the meteoric rise in the use of mobile devices and smart phones. Here at Next-Mark we realize the importance of reaching that audience and “Goin’ Mobile” with our clients content. The most effective marketers are making their messaged loom large on the small screen. The lyrics of “Under One Sky” are obviously up for interpretation. However, as we (choose to) understand it, we unite with our clients “Under One Sky” to reach the same objectives so their success becomes our success. From building brand awareness to engaging a specific target audience to launching a new product and far more, we collaborate with our clients on the highest level in order to ensure we accomplish the desired result. At Next-Mark, we are constantly pushing the boundaries of creativity; in our line of work, we can’t be afraid to try something innovative and imaginative. We strive to build trust with our clients’ customers, as well as enhance their brands visibility. Thus it’s important to create exciting, relevant and insightful content that will spark a conversations. Now, if you’ll excuse us, we have to slam on some ear buds and get busy.